Well this had been an exercise in awkwardness, for sure. Kade hadn’t felt this bashful around a woman in a long time. Normally they didn’t tell him things like that. He didn’t have any reason to be “shy” but when it came to this topic… well it was just… awkward. He was a gentleman, no matter what anyone else said of him, and he neither did things in this topic, nor discussed it. Still, it gave him just one more reason to hate Tatsu. That man deserved to lose a hand. Kade forced himself to remain calm. He did not need to let himself get this worked up. Surely Kotone wanted to just move on. He wasn’t sure why he was saying it, it just came to his mind. Maybe they should just go back to hanging out and talking. “Do you like spending much time around people? Getting to know them, that sort of thing. I’m fairly partial to it, personally…” he told her. He had basically relaxed by now. He still felt awkward internally, but he was moving past that. Now he was trying to figure out if he could introduce her to his friends. He loved people and learning about them. It was definitely another one of his character traits, and as they had been looking for ways to relate to each other… well it seemed like a fair question to ask. Plus his guild was his focus, and the people made the guild. “I’m glad too,” Kotone nodded, wishing that her stupid cheeks would stop burning. It would be less awkward if she could physically make herself look like she was less awkward, but trying not to just meant it was going to keep happening. She would just have to keep talking and hope she moved past it before he decided she was dysfunctional and left. “I’ve been ah, practicing random conversation a bit I guess. I mean, with you and Ren mostly. I don’t consider myself that good at it. I'm better at arguing or yelling...” She'd lost a lot of her fire for the yelling part when she'd decided she couldn't keep being so bitter though, so her main avenue for communicating was less common and effective. No wonder she had spent so much time alone in the house lately. Kade decided to ask her another question about how much she liked spending time around people, and whether she liked getting to know them. The basic answer was no, Kotone wasn’t a big fan of people. But that was her own fault and she was trying to move past the bitterness she’d come to feel for the people she’d sworn to protect for never properly appreciating her. Kotone blushed a bit more, her heartbeat picking up slightly as she thought about how to best answer his question. “Me and people are complicated. But… that’s my fault,” she told him honestly, deciding to just go with the direct truth. “But when they turn out to be nice, it’s... nice…” she decided, thinking about how she started talking to Kade before, and now she was having a blast doing so. More than normal, actually. It was never boring, no matter how mundane the moment, to the thrill-seeking dragon slayer. Kade was glad to be having this talk with Kotone. It seemed like she was really opening up and relaxing. Even if they had hit a pretty big roadblock in the form of awkward groping comments. He would have to stop himself from decking Tatsu if things happened at a later date. Decking him… or stabbing him. No, that wasn’t it. Kade didn’t use weapons. He did had light shurikens… those could-… okay, yeah, no. He was not fantasizing about harming anyone. He was just sitting with a lovely young woman and talking to her about… yelling? “Well, the only way to get better at conversation is by partaking in it. I was pretty bitter when I first hit mainland, but now… well I’d like to think I am a pretty sociable person by now,” he told her, that same easy smile on his face. Sure she was blushing, but he felt like he had relaxed again. A few stray violent thoughts, but nothing too horrible. He’d asked her how she liked spending time with people, and it was pretty clear she didn’t like it much. She blushed some more, which confused him, but he just waited for her to answer. Complicated. Her fault. He frowned. She seemed vulnerable again. Understandably. It seemed like she was trying to branch out and make connections, and here he was just showing up, in her private dwelling, asking her personal questions. It would make anyone a bit vulnerable seeming. He smiled again when she said people turned out nice and that was nice. “Well, I think that’s a pretty good thing. Tell me… does that mean I’ve turned out to be nice? Or am I just a bother?” he teased her lightly, clearly just joking around. Hopefully keeping things light would ease the mood for both of them. Kade was a pretty sociable person. Kotone knew it, and she appreciated it to say the least. He’d actually visited her at her home, which was something no one did. He’d seen her house and her secret army of children’s plush dolls. Oh yeah, she was all sorts of vulnerable. The butterflies in her stomach when she talked to him or looked at him didn’t help that in the slightest. So was she saying more than she normally might have? How would she know? He was also a dragon slayer she respected. She might have told him whatever just for that. Unfortunately for Kade, Kotone was a serious girl in a serious mood, and in that situation, she often missed even obvious jokes. “Oh, not at all!” she insisted, shifting to face him more and leaning towards him as if to show she were engaged in the conversation. “I love talking to you,” she told him earnestly. “I uh,” she rubbed the back of her neck, “I mean… if you wanted me to meet someone though… it’d probably be fun.” The answer was partially because she had decided she trusted his judgement about people, but it was partially because it was an excuse to do more things with him. Why was she so obsessed with him? It made her think of that display between Hannah and Roejaster, and… oh. Another blush appeared on her face as she looked away. Well, that was an interesting possibility. Mr. Social Dragon Slayer had liked girls in the past. And wow, was he really the most social dragon slayer? Of the ones he knew… yes. Of the ones he didn’t know… wasn’t sure. He figured there was an amount of danger being in the spotlight with a big secret. It made sense to be more secretive. If anyone could figure out you were a slayer, you had pretty much failed. He understood Kotone though, have life being thrown around like it had at such a young age. Certain other murderous perverts… well, he would spend his energy on the lovely Kotone instead. She was a ball of awkwardness, and it was very endearing. “Don’t worry about it. The next time we are both at Lamia Scale, I will see about introducing you to a few people. Such as my friend Zahn. He recently joined Lamia Scale after the tournament. Or just anyone. They are a bunch of good kids as far as I am concerned,” Kade told her seriously. “So… do you have any places around town you might want to show me?” It seemed like a good way to get some air. Kade was just teasing. Right. Kotone liked him, and she was flailing because of it. She had no idea what to do about it, but supposed she’d just enjoy the attention she was getting as best she could. You know, between flailing and daydreaming about him. Wow, she’d become that person she’d made fun of when Hannah had been giving Roejaster googly eyes. What was more surprising was, she didn’t really mind. Kade was very handsome, and nice, and she was happy to be around him, especially when they got the chance to talk alone like this. Kotone was in full flail mode in her head, and even though somewhat calm thoughts were running through her head, they weren’t actually going through her head in a calm manner. She managed a nod in acknowledgement to his talk of teasing while she came to grips with her new realization. She hoped she wasn’t being too obvious. Unless that was a good thing. Then maybe? Kotone wasn’t sure. She suddenly wasn’t sure about anything. She’d never liked anyone before, like… ever. She’d barely liked anyone as people before she met Kade. And now this feeling was new. “I-I’d be happy to,” she nodded, suddenly sounding sincere more than wishy washy about meeting people. “Zahn seemed like a nice guy, even though I couldn’t really hear what you were talking about on the island. And anyone else… well… I’m sure you have good taste,” she decided as she sat cross-legged with her hands in her lap facing him. She wasn’t blushing now, but she was distracted by her thoughts. She had nothing to compare this to, personally, and no one to talk to about it that she knew of, so she felt a combination of excited and lost right now. Kade wasn’t a major jokester, but he had a happy attitude about things most of the time, and that could lead to kidding around. He didn’t want to make anyone upset, and sometimes things just needed to calm down so that they could be enjoyed. This situation could get tense without him even realizing why, and he wanted to just have a nice time with Kotone. He had seen a lot of people having crushes, but for the most part, they did not act like Kotone. Kotone was still kind of adorable flailing about like she was in her head. Even though Kade didn’t know what she was doing, or that it was adorable, he absolutely would have thought that had he known about it. Kotone, stuttering but nodding, said she would be happy to meet people. She also said she hadn’t been able to hear them on the island, “Is that so? Well that’s a good thing. I think we were all on edge about even relaxing because we felt spied on at every second. Especially Ren and Zahn. I think Ren has more secrets than I do, and Zahn has more paranoia. Not that I’m speaking ill of them,” he told her, wanting to make that clear, “It just made for an interesting competitive camping trip. But I think it’ll be good. I know you sometimes visit Ren… are there many people you make a habit to keep up with?” She was a sweet girl, but clearly more of a loner, and lonely. Or maybe he was just assuming that last part. Still, he was trying to get to know her better. “Oh! There’s a place we could get a bite to eat. Or we could just walk around.” She continued making suggestions. It was as much his home town as it was hers, she supposed, but he was visiting her, so she felt the need to come up with things. “Whatever sounds fun,” she nodded. What did people do together? She’d gone fishing with Ren, but she wasn’t really in the mood for that this time. It involved too much quiet. It wasn’t even remotely surprising to hear that Kotone kept to herself. Still, it was impolite to just make assumptions. He wanted to get to know Kotone, wanted to get closer to her. Part of getting to know a person was simply knowing things about them, but Kade felt that just as much of that was actually spending time with them and learning about them from personal experience. Some things about people could not be conveyed in comments and facts. It was the way she blushed, or mellowed out in some topics, or seemed to hold herself to such a high standard. Things only learned from spending time together. Kade had time for that. Kotone was more excitable than the mellow outward personality she had. Even when she wasn’t trying to lie about who she was to keep people away, she had a tendency to both want to look mellow and yet explode with anger or excitement. She was a complicated girl. She knew that. But being complicated didn’t mean she could stop herself from continuing that trend of blushing and mentally spazzing when he chose the words “I would actually like to spend time with the girl I am visiting.” She grinned a simpler grin than before. Where when she was excited or excitable her fangs were often shown off, they were only very slightly visible with her more appreciative and somewhat more humble grin. “Walking sounds good,” she nodded, taking her hair out of its ponytail and putting it back on a bit tighter for going outside. “Just ah, give me a minute,” she told him as she started opening drawers and things to find clothes she was comfortable wearing outside. “Er, you might want to wait out there,” she told him once she’d paused to blink as if she’d forgotten she should push him out of her room before she’d gotten changed. Then again he might not but neither of them were having any of that, and she knew it. A few minutes later she emerged in clothing far closer to her traditional garb, boots, skirt, blouse, and all. She was shrugging on her jacket, but didn’t have her sword on her. She wasn’t planning on going far. Sid would guard it. Plus, she hadn’t needed it in the past. “Ready!” she nodded, a twinge of excitement to her slightly calmed down demeanor. Being excitable, emotional, or extreme, were not bad things. Kade didn’t mind. He found Kotone and all her visible quirks to be endearing. It helped that they started off on the right foot. Sure he could have teased her about their real first meeting, her bragging about being a dragon slayer, but he probably wouldn’t. Well, it was possible, just to make conversation. He wondered how she would handle that. She suddenly felt the need to change. At the suggestion he might want to leave he cleared his throat. “A good idea,” he said as he headed outside. He waited for her next to the front door, and when she returned he nodded and said, “You look nice.” It was both a polite and casual comment… and the truth. She did. He found people appreciated compliments, and he was a positive person, so he gave them out. Kotone chuckled at the noticeable throat clearing when Kade had left the room. Not before, but certainly after. By the time she emerged though, he was waiting with a compliment, saying she looked nice. Geeze, why did she have to have those stupid butterflies making her overreact to everything? She felt her face heat up even as she tugged at the collar of her blouse, and looked down at herself. “It’s basically what I normally wear…” she insisted weakly. It was obvious she wasn’t actually trying to argue. If anything, she was confused. “Hey, I’ve walked around with people I liked a lot less than you,” she told him, clamming up for half a second as she pondered how that sounded to him when she said it. Hopefully not bad. Or forward. Both were bad for her, as far as she could tell. “But… you’re right. I was a jerk. I don’t even know what possessed me to be nice to Ren that day,” she admitted. “Helping people was a chore during that time of my life. I resented it. I made people hate being around me. I even got kicked out of a few places. Basically I was a jerk… and I might not have given you much thought without the whole… dragon slayer thing.” Kotone was silent for a moment, feeling a bit down about her attitude she’d had when they’d first met. “But really, I like spending time with you. You’re like… pretty up there in my choices, and not just because you’re… well, like me,” she told him, sticking her hands in her jacket pockets and blushing a bit. Kotone had a way of reacting to simple compliments from Kade. He could chalk it up to her being uncomfortable getting compliments. She didn’t seem like the kind of woman that let herself receive a lot of compliments. Yet there seemed to be more to it. She blushed pretty commonly around him. He decided to put that thought away until later. It wouldn’t affect how he acted, but it was starting to make him wonder. “Well, who says what you normally wear isn’t nice?” he offered as a counter argument. She offered her last name. Hoshino. Of course that was before saying she hadn’t been called Miss before. He shrugged, “A lot of people speak differently than I do, so that isn’t surprising. But you’re a lady, so calling you ‘Miss’ isn’t that unusual for me.” She began explaining her last name. Star Field. That was pretty. Apparently she had thought the same, when she was ten. She was so shy about things that made her seem human, it was interesting. “It does sound pretty, and I’m most certainly not ten,” he told her with a friendly smirk. Maybe what she wore normally *was* nice. After all, she had always liked it, and it hadn’t changed much more than it had to over the last three years or so. She had other clothes, which she wore on special occasions or when she was at home, but she liked skirts and blouses, and especially liked jackets despite the fact that she didn’t get cold. Most of the time it was a fashion statement when she chose to wear something. She nodded her understanding to being called “Miss,” but didn’t feel like speaking up about it. Miss felt a little impersonal, but she supposed he probably didn’t mean it that way.”To tell the truth, I still like it. Even if It’s not my last name. 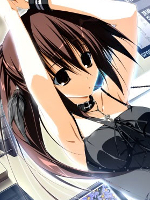 I only know Kotone’s my real first name because I had a bracelet that I long since lost,” she admitted, smiling gently. “Alright,” she finally decided when Kade wouldn’t let her feel bad. “I won’t feel bad about who I used to be if you won’t feel bad for what you’ve done either. We’ll learn from it, and show the world we can mature, okay?” she told him, as if it were something to prove to people. She didn’t necessarily think it was, but it was kind of the way she thought. Proving herself was good motivation, if nothing else. By now, they’d walked outside and left Sid to guard her sword and plushies. He wasn’t the best guard cat out there, sure, but Kotone seriously doubted anyone with brains would target ‘her’ home for a robbery, and she left it unlocked when she left for short outings. The pair walked past a decorative pond full of coy. A few tourists were standing around feeding them, but Kotone was used to travel, herself, and didn’t think much of new faces. Besides, her thoughts were on the cute guy she was lucky enough to have the attention of right now. She stopped at the bridge, leaning over the railing to look down at the large fish as they spotted the traveling duo and surfaced in the hope of getting something to eat. Kotone giggled as she stared down at them. Kade was a great guy to be around, and he was a dragon slayer. He understood her better than she’d hoped. “No matter how many times I go past here without feeding them, they never remember that I’m not one of the tourists,” she grinned, her amber eyes flitting around as she tried to relax and enjoy the moment. “Mmmm,” Kade said when Kotone said the only reason she knew her name was a bracelet. A lost one. That was pretty sad. “So, do you have any actual memories of your birth family?” he asked, not sure if she did. It did seem like she didn’t have any memories. It seemed confusing. Yes, dragons could be parents. They could be good mentors, guardians, and parents… but not having any memory of your origins? He loved to learn about people, and know their stories. Not knowing his own would just… not work. They were apparently deciding to be positive together. Kotone about her past, Kade about recent events. He didn’t really want to relent on things, but it was worth it to make her happy. They pair of them walked past some beautiful coy fish. Unfortunately his mindset was that they were edible. He appreciated that they were interesting and beautiful creatures to look at… but it was a complicated thing for him. He could appreciate life and beauty, and yet… survival and the dragon slayer in him sometimes won out over that. More often with animals than anything else. “No memories,” Kotone shook her head. “None that help anyway. Flashes. Nothing specific. I don’t even remember my mother’s face,” she admitted. It didn’t sound sad. She’d long since stopped being sad about that. She liked the father she’d had, even if she did hold a grudge for him just up and leaving. Humans weren’t built to take such mysteries of abandonment lightly. Kotone blinked when he asked if she’d ever wanted to feed the fish. She hadn’t really thought of it, strangely enough. She’d thought of it as an activity for tourists. “Uh, I’d never thought of it,” she told him. “They are pretty though. Sure. I’d love to feed them,” she told Kade with a nod and a grin. She actually didn’t seem to have stopped grinning that day, but there were times when she grinned more than others, and this was one of those times. She didn’t think it was sad, but Kade found it sad. He could think of his mother, out back in the garden. Her delicate hands checking each individual plant and collecting them with care. He couldn’t think of a lot of memories of his mother. Enough he had the vague images. He could not imagine being without those images. Even if Kotone had a problem with her past, and accepted a lack of family history. She could think it wasn’t sad. Kade found it sad. “Well… I am sorry…? I am not sure what to say with that, but I suppose I would feel differently about it.” He should leave it alone. “You are,” Kade said. She was pretty. He didn’t spend time thinking about it, but when it came up, he realized she was actually quite good looking. That was an odd thought. She seemed surprised and sort of adorable when he asked her about feeding the fish. She had never thought to feed them. Well then that was another activity that she hadn’t done, and he could open up another activity. The idea of doing something with her was surprisingly ideal. “Really? Well then we absolutely should go get something to feed them. I know where to get some food for them. I’d love to do that with you,” he told her, enthusiastic to go do this. “I do wonder sometimes,” Kotone admitted when Kade expressed that he would feel differently about not knowing his pre-dragon past. “It used to make me sad some days, but Dad would comfort me the best he can.” She stared down at the fish for a long moment in thought before looking up and giving Kade a grin. “Can we go and get fish food now?” Kotone stood up straight, waiting for Kade to take the lead before quickly catching up and walking beside him, a bit closer than she normally walked beside people. Kotone walked beside Kade, unsure what to talk about. Instead, she just decided to talk about fish a bit. “They actually are pretty fish,” she noted as they walked towards the place where they could get the food. “Sid wishes so much he could catch one of them. He loves fish almost as much as he loves turkey,” she chuckled, shaking her head at the thought of her favorite little cat trying to stick his paw in the water and collect himself a fish. The fish were nearly three times the size of the small cat, so he didn’t actually have a chance. It didn’t seem to stop him from dreaming. “Mmmm. Well you seem well adjusted, despite the harships,” Kade admitted to Kotone. He wasn’t sure if there was something more beneath the surface, but it wasn’t his place. He was fairly fond of the ice dragon slayer, but he knew not to push certain personalities. Too much too quickly was inappropriate, and for how comfortable and happy he was getting to know people, he had to use his brain when going about things. “Of course,” he said as for getting fish food. On their way to a small store Kade knew of, he listened to Kotone’s comment about Sid. He smiled, it was a cute thought. “Turkey, hm? Sometime you should come by when I am grilling food at Lamia Scale. I’m sure Sid will appreciate it, and I know some people who would like to see you around.” They entered the store and Kade walked to the back. It really was weird being here. The store hadn’t changed, and when things were familiar from his childhood they felt uncomfortably dreamlike. He didn’t let on, but he felt like getting through this quickly. “So, how long have you had Sid?” He seemed like the most vulnerable part of Kotone, and Kade wondered how long the pair had been together. Well-adjusted. That was one way to look at it. Kotone had been rather broken for a while because of her hardships. She couldn’t help but feel like he was wrong, but hardly voiced it. That wasn’t what she wanted to focus on anyway, and instead followed him into the store. He seemed to know exactly where everything was – a fact that she found curious, but kept silent about it for now at least. He had lived here before, after all. Some places never seemed to change no matter how often you went back. Kotone happily took the food from Kade and held it in her hands, which were crossed in front of her lap with her fingers interlaced as walked beside Kade back towards the pond. “I found Sid in an alleyway in Cerulean Town.” Kotone glanced at Kade with a gentle grin. “That was three years ago. He goes with me everywhere, more like a dog than a cat. He’s cute and soft and smart and tiny.” Sid really was Kotone’s most vulnerable subject. Even when she yelled at him or insulted him, it didn’t take much to realize she didn’t mean any of it, and that Sid didn’t seem to mind beyond losing the food he wanted so badly. She moved slightly in front of him before spinning around and walking backwards, looking up at him. “I want to know more about you,” she told him directly. “But I don’t know what to ask. You don’t have pets and I can’t say you look nice in a skirt…” Kotone giggled to herself quietly, continuing to walk backwards easily. She stepped around a big rock without even looking, and did a graceful spin around a tourist who wasn’t paying attention to the girl walking backwards before resuming her backwards walking and paying attention to Kade. She turned around and began walking backwards gracefully. It was an amusing display and he smiled when she giggled. He was pretty sure he would not look good in a skirt. He would look foolish, possibly funny, but not goo. “Well, its nice that you want to get to know me. I guess I am not so used to people wanting to know about me. I’m good at getting to know other people. I am a receptor, a library… I used to spend a lot of time in the library in town, actually. That was… the last place I was before I left,” he admitted, skipping over the part about hiding for his life. “I take my responsibilities seriously, and I want little more than to learn… and to help my guild. Its just… I know I do not lack a personality, or a history, but I find it easier to talk to people about themselves, or their stories… instead of my own. They may prove problematic to your wanting to learn about me, unfortunately,” he admitted with a shrug. “Well it’s certainly not useful to me not knowing what to ask.” Kotone agreed, her expression going from amused to one that was slightly less so. She recovered quickly though, and had flipped back around to walking side by side with him again. “I admit…” she started, her voice more serious and less awkward or carefree, “I know it’s hard to miss what you can’t remember, but it doesn’t stop me from being a bit envious at you remembering your past, however brief or even unpleasant it may have been.” They stopped at the bridge again, the fish popping up below just like last time. Kotone smiled again when she saw them. “I know I’m pretty,” she told the fish, “But that doesn’t automatically mean I can feed you. Good looks don’t pay the bills. Unless you’re a model. I’m neither that pretty nor that comfortable showing off if it’s not punching people.” She was talking to the fish, but she didn’t mind Kade hearing too, considering she was sharing again, and he seemed to like to learn. “Fortunately for you, my friend Kade bought you some food.” She held the bag out, sticking her hand into it and pulling out some of the food, which she dropped into the water and watched them swarm. It caused her to giggle again. She’d finally relaxed at least somewhat, and was acting more casual and happy than awkward. “Probably not,” Kade agreed. They spoke again about her lack of memories, but he let it go without a comment. He was curious and had things to say, but since she could not remember, it was only potentially frustrating or sad. She seemed fine now, but there was no motivation to carry the conversation on longer. A change of subject was appreciated. Kade chuckled when Kotone told she fish she knew they were pretty. She wasn’t pretty enough to be a model, hm? “That might not be true,” he told her casually, not mentioning which thing he was specifically commenting on. She giggled adorably as she fish swam for the food she was giving them. “Now they’ll want food from you every time,” he warned her, despite it being his idea. Still, he was grinning and light hearted, so it was clear it wasn’t a serious comment. They would have wanted food either way. “I’ve learned you should ask Ren…” leading questions if you want her to do what you think she should… “anything. She isn’t the sort to offer up any information, but sometimes I think she would answer if asked. As far as me… nothing is too personal. I give you full disclosure. If I can’t answer or don’t want to, I will say so. Although I can’t imagine anything I would refuse to answer. I’m curious what you would think to ask if you did give it some time,” he admitted with a smile. Kade cleverly told her that something might not be true, though he was rather vague on what exactly wasn’t true. He also added that the fish would want something from her every time she crossed the bridge now. Kotone just chuckled again. “Sounds like a certain cat I know,” she commented, not all that concerned by how easily animals were spoiled, but still interested in watching the fish eat. She’d eaten a lot of fish, but they were never pretty like these. She turned and looked at Kade when he started telling her that she could ask him literally anything. At first, she thought about how that really didn’t help. It didn’t give her ideas and it certainly didn’t narrow anything down. She grinned though, and turned back to the fish to think for a moment. They were circling vaguely now, hoping she would throw in more food, so she did. Kotone sighed semi-contentedly, doing her best not to rush herself and actually come up with something. “First off, what exactly wasn’t true?” Kotone began curiously. She turned back around and leaned on the bridge again before pulling herself up to sit on the railing. “Second…” Kotone had settled on a leading question - one that was vague and would hopefully force him to think and give him an interesting answer. “What makes a guy like you smile?” she asked, grinning. She was pleased with herself for that one. They were friends. it was a good question to ask to know what to do to make a friend happy, as far as she could tell. Not to mention, it would provide insight to the kinds of things Kade really appreciated. “Maybe your cat has been giving lessons to these fish. You never know, maybe he wants to be their mentor, and isn’t actually trying to eat them,” he teased her with a grin. It was a nice conversation. She seemed so much more at ease than she had the first time they met. Of course she hadn’t seemed uncomfortable, but the contrast was so stark that he wondered if she had been back then. Giving Kotone the ability to ask anything might not have been smart. Surely there were things he didn’t prefer to talk about, but he felt he was good at pushing past that. He didn’t expect the question she asked and chuckled a little in surprise. “Right, that… the model comment. You said you were not pretty enough to be one,” he reminded her with a shrug. He reached into the food bag and got a handful for himself. He began tossing individual bites off into the water farther away, thinning out the pack of fish if they noticed the new food. Kotone chuckled at Kade’s comment about the fish, but she couldn’t help but mentally disagree. Sid was a little piggy, and would eat just about anything he could get his paws on. Kade was wrong about her on her first encounter with him though. She didn’t act it like a normal person, but people, especially new ones, made her uncomfortable in general. She’d acted how she had to Kade partially because she was overcompensating for said discomfort. What surprised her was that he was, in fact, talking about her not being pretty enough to be a model. She thought she’d calmed down enough not to blush, but the redness of her cheeks was undeniable, even to her when he said it. She leaned over to look into the water at herself, or as much as she could from the top of a bridge. The redness of her cheeks was visible from here… was she really actually pretty enough to be a model? It wasn’t like that had ever been on her list of things to do, or even want… but being told she could was a different story entirely. Kotone was hardly vain, but she’d always taken pride in her appearance – at least since she’d started living around people who had taught her that being clean and nice looking was important. It was flattering that Kotone said Kade was one of the things that made her smile. There was definitely something there. He didn’t want to give it too much thought, but he couldn’t really ignore it. She blushed often, and she said he made her smile. On top of actually seeing her smile a lot. He wanted to chalk it up to her actually getting a visit, but… he wasn’t quite that oblivious. He just allowed himself to pretend. He smiled when she told him that he made her smile. People appreciating her. He made a note to do that more. It was sad if she was underappreciated. He knew Ren worshiped Kotone, basically, but not everyone did. She was a dragon slayer, someone who, for better or for worse, had tried to help. She had been young, and he knew that was harder, but she should still be appreciated. Sparing with people. Snowcones. Friends. And being visited. He smiled some more, “Well I will just have to keep all of that in mine. Maybe someday I’ll show up for a visit with a snowcone. You do make good company after all,” he reminded her. And they could probably even spar. He was never lacking in the desire to improve, and he wasn’t fighting enough, so certainly he could use someone else to train with.